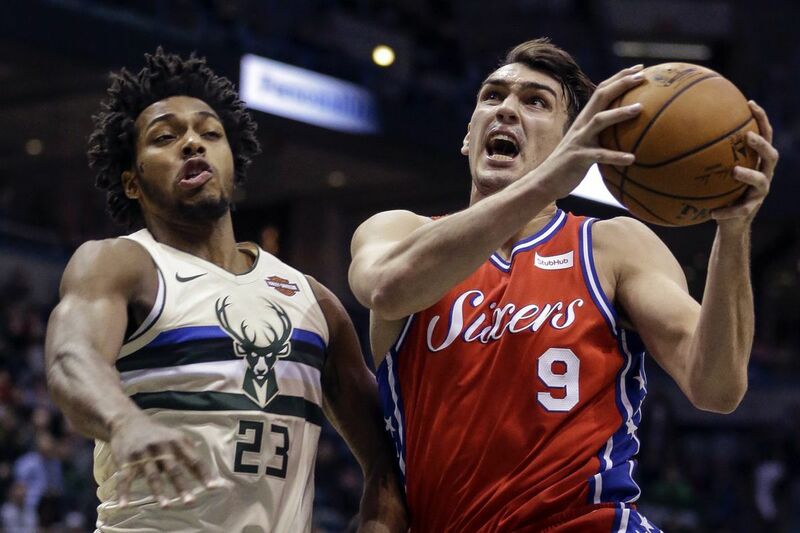 The Bucks' Sterling Brown, left, tries to stop 76ers forward Dario Saric during the first half. MILWAUKEE — Here are my key takeaways and "best" and "worst" awards from the 76ers' 107-95 loss to the Milwaukee Bucks on Monday night at the BMO Harris Bradley Center. — The Sixers still have a tough time figuring things out when Joel Embiid doesn't play. They looked lost and without solutions Monday and dropped to 2-8 without him. — Either teams are starting to figure out Timothe Luwawu–Cabarrot, or his hot shooting stretch is over. The Sixers shooting guard had another subpar performance. He scored six points on 2-for-8 shooting and missed all four of his three-pointers. — As good as Dario Saric is, he needs to improve his play against athletic power forwards. It's hard to criticize him for struggling to defend All-Star forward Giannis Antetokounmpo. However, this was just one of many games in which he failed to keep up with more athletic players. — The Sixers didn't do a good job of making adjustments. The game plan was to hit a lot of three-pointers with Embiid out. That didn't happen, as they shot 2 for 26 on three-pointers. They were 0 for 15 in the first half, and still attempted 11 more. With the shots not falling, this would have been a great opportunity to take advantage of their points-in-the-paint edge (they finished with 60, and the Bucks had 38). — T.J. McConnell is still listed as Ben Simmons' backup at point guard. However, the third-year veteran has been seeing a lot of action as a two-guard. That has hindered his effectiveness and rhythm. He finished scored only two points on 1-for-5 shooting and had a game-worst five turnovers. — Best performance: This was easy. Giannis Antetokounmpo destroyed the Sixers with 31 points and 18 rebounds. This marked his ninth 30-point/10-rebound game of the season. — Worst performance: I had to give this to McConnell in what was one of his worst performances since the start of the 2016-17 season. — Best defensive performance: This goes to Kris Middleton. The Bucks small forward finished with two steals and one blocked shot. — Worst statistic: The Sixers shot a season-worst 7.7 percent on three-pointers. — Best statistic: I had to give this to the Sixers for hitting 91.3 percent of their free throws (21 of 23). — Worst of the worst: The Sixers' three-point shooting. A fair share of their attempts were wide-open shots.